Passport renewal has never been easier than it is now for Philippine passports at the Department of Foreign Affairs. There are legal ways to avoid long files of people; yes, legal, with no bribing involved. And it doesn't need magic tricks to do so, just a few techniques here and there. 1. First, book a schedule through the DFA appointment system online. Well, there's no option to walk in for an application these days anyway. Everyone is required to set an appointment over the web. Sadly, some people are offering this service (for those who are not tech-savvy) with a fee when it is actually free. 2. If your preferred schedule is no longer available, there's an option to try another branch. I thought of mentioning a DFA branch where there are not much people and renewal can be completed within 2 hours or less from the moment you enter the DFA door (not including waiting time outside though). But let me just say that most mall branches aren't as full packed as the actual regional offices. 3. Choose dates that are often not selected by many. Most booked days are Monday and Fridays. 4. Arrive an hour or earlier before your schedule so you will be seated on a specified waiting area along with other people who have booked within the same time bracket. This allows time to check documents and make sure you didn't miss any. There are photocopying machines available in case you need to obtain several copies of a certain file. The DFA guards can help with this. 5. Prepare all documents needed before the actual scheduled date so you won't be asked to come back again if you missed any. If you are 100% sure yet an officer is looking for something else, quote a certain rule or even show a link from the DFA website to support what you know. Some of the crucial issues involve travelling with minors and you may need to refer to other websites such as the Department of Social Welfare and Development for more information. 6. 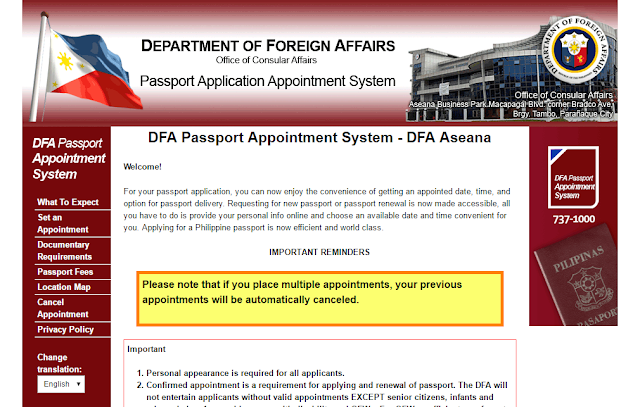 Cancellations should be completed within the allowed time frame; otherwise, you'll risk being banned from booking a future appointment from the same DFA office. 7. Be attentive while seated at the organized seating arrangements per section. Listen to names being called or numbers flashing on LED display screens. Make sure you are sitting at the right section too - validation, payment (cashier), photo capture, etc. There you have it. Have a safe trip abroad, whether it be for work or personal purposes!